The medieval Universe was ordered, finite, harmonious and could be defined by circles. The Earth was at the centre of a series of concentric spheres onto which the Moon, the Sun and the other planets where attached. Beyond the sphere of the Moon there was no decay or death and Earth-like physical laws no longer applied. All objects in the heavens were thought to be made from a fifth element which was impervious to change (see Medieval Views of the Cosmos by Edson and Savage-Smith, Bodelian Press 2004). However, in 1572 on 11th November something unexpected occurred. A new star appeared, one that was so bright it could be seen in the day time. It was a supernova in the constellation of Cassiopeia and it was recorded and catalogued by the Danish astronomer Tycho Brahe. Today it is called beta Cassiopeia or SN1572. 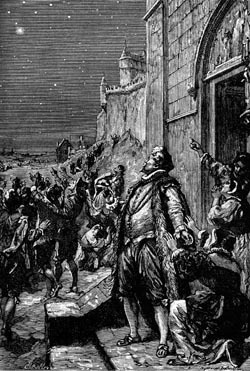 An engraving from Flammarion's "Popular Astronomy" illustrates this and shows the shock and disbelief on people's faces and their panic as they saw the star appear for the first time. A Universe which was supposed to be impervious to change could not produce a new star but this new star could be clearly seen by everyone. Clearly something was not right and people's beliefs where challenged. One explanation offered at the time was that the new star was inside the orbit of the Moon but this was not widely accepted. "Last night of all, When yond same star that's westward from the pole Had made his course to illume that part of heaven Where now it burns, Marcellus and myself, The bell then beating one,--"
Could Shakespeare have been referring to the new star? I think he could and in 1609 many people would still have remembered seeing this new star in the sky because as it was so unusual. However, Hamlet is interesting to astronomers for another far more interesting reason which I will discuss in a later post.